I have been vacillating between depression and acceptance of where we are, both as victims – fragile human beings – and as perpetrators: We are the species responsible for altering the climate system of the planet we inhabit to the point of possibly driving ourselves extinct, in addition to the 150 to 200 species we are already driving extinct daily. Can you relate to this grieving process? If so, you might find solace in the fact that you are not alone: Climate science researchers, scientists, journalists and activists have all been struggling with grief around what we are witnessing. Take Professor Camille Parmesan, a climate researcher who says that ACD is the driving cause of her depression. Last year I wrote about the work of Joanna Macy, a scholar of Buddhism, eco-philosophy, general systems theory and deep ecology, and author of more than a dozen books. Her initiative, The Work That Reconnects, helps people essentially do nothing more mysterious than telling the truth about what we see, know and feel is happening to our world. I recently came across a blog titled, Is This How You Feel? It is an extraordinary compilation of handwritten letters from highly credentialed climate scientists and researchers sharing their myriad feelings about what they are seeing. With Joe’s permission, I am happy to share the passages below. In the spirit of opening the door to a continuing dialog among readers about our collective situation, what follows are the – often very personal – thoughts and feelings of several leading climate scientists. Professor Peter B. deMenocal with Columbia University’s Lamont-Doherty Earth Observatory shared an analogy to the climate scientist’s predicament, comparing it to how a medical doctor would feel while having to inform their patient, who is an old, lifelong friend, of a dire but treatable diagnosis. The friend goes on to angrily disregard what you have to say, for a variety of very human reasons, as you watch helplessly as their pain and illness unfold over the rest of their now-shortened life. “Returning to our patient, I feel frustrated that my friend won’t listen,” he concluded. I feel like nobody’s listening. Ok Sure, some people are listening but not enough of our leaders are listening – those that make decisions that influence all our lives. And climate change is affecting and will continue to affect all our lives. I feel perplexed at why many of our politicians, business leaders, and members of the public don’t get that increased CO2 in the Earths atmosphere is a problem. The very premise that CO2 traps heat is based on fundamental physics – the very same physics that underpins so much of modern society. The very same physics that has seen higher C02 linked with warmer periods in the geological past. And sure, there have been warm periods in the past and the Earth weathered the storm (excuse the pun) but back then there weren’t millions of people, immovable infrastructure, or entire communities in harms way. I feel astonished that some would accuse me of being part of some global conspiracy to get more money – if I was in it for the money I would have stayed working as a geologist in the mining industry. No, I do climate research because I find climate so very interesting, global warming or not. I feel both exasperation and despair in equal measure, that perhaps there really is nothing I can do. I feel vulnerable, that perhaps by writing this letter I expose myself to trolling and vitriol – perhaps I’m better off just keeping quiet. Dr. Jennie Mallela with the Research Schools of Biology and Earth Sciences at the Australian National University shared a range of emotions, including optimism. I asked Dr. Ira Lefier, an Atmospheric/Oceanic Scientist whose research has focused on methane how he felt about our current situation. He expressed his concerns and frustration, but also optimism. “I find the current situation is highly distressing, in that the facts regarding global warming have been known for many decades, because like an aircraft carrier avoiding a collision, course changes can easily be managed well in advance, but become impossible at the last minute – inertia seals the future destiny,” he said. “And I ask myself, what did we (scientists and activists and concerned citizens of the planet), how did we get here, so close to the midnight? And I think that there was a tragic underestimate based on the successful campaign to save the Ozone Layer through the fight against CFCs – a gas with almost no political lobby, that the global society could easily accept the widespread changes needed to address global climate change through reducing CO2 emissions – which affects almost everyone on the planet. And that political change could be engendered simply by scientists presenting their facts and observations. For sometime now I’ve been terribly worried. I wish I didn’t have to acknowledge it, but everything I have feared is happening. I used to think I was paranoid, but it’s true. She’s slipping away from us. She’s been showing signs of acute illness for quite a while, but no one has really done anything. Her increased erratic behavior is something I’ve especially noticed. Certain behaviors that were only rare occurrences are starting to occur more often, and with heightened anger. I’ve tried to highlight these changes time and time again, as well as their speed of increase, but no one has paid attention. To me this is all false logic. How can you ignore the severe sickness of someone you are so intricately connected to and dependent upon. How can you let your selfishness and greed take control, and not protect and nurture those who need it most? How can anyone not feel an overwhelming sense of care and responsibility when those so dear to us are so desperately ill? How can you push all this to the back of your mind? This is something I will never understand. Perhaps I’m the odd one out, the anomaly of the human race. The one who cares enough, who has the compassion, to want to help make her better. The thing is we can make her better!! If we work together, we can cure this terrible illness and restore her to her old self before we exploited her. But we must act quickly, we must act together. Time is ticking, and we need to act now. I feel frustrated. The scientific evidence is overwhelming. We know what’s going on, we know why it’s happening, we know how serious things are going to get and still after so many years, we are still doing practically nothing to stop it. I feel concerned that unmitigated our inaction will cause terrible suffering to those least able to cope with change and that within my lifetime many of the places that make this planet so special – the snows on Kilimanjaro, the Great Barrier Reef, even the ice covered Arctic will be degraded beyond recognition – our legacy to the next generation. Public indifference and individual short-sightedness aside, I am furious that politicians like Abbott and his anti-environment henchman are stealing the future from my daughter, and laughing about it while they line their pockets with the figurative gold proffered by the fossil-fuel industry. Whether it is sheer stupidity, greed, deliberate dishonesty or all three, the outcome is the same – destruction of the environmental life-support system that keeps us all alive and prosperous. Climates change, but the rapidity with which we are disrupting the current climate on top of the already heavily compromised environmental health of the planet makes the situation dire. Joe told me the response to his project has been, in general, positive. The term “climate change deniers,” then, has an entirely new – and ever more relevant – meaning when viewed through the lenses of the Kübler-Ross five stages of grief, given that “denial” is literally one of the five stages. Joe is now asking laypeople to send in their letters about how they feel, and plans to publish those as well. “This approach is not the only way to communicate on climate change, but it is one way, and I certainly feel that it is effective,” he concluded. The practice of scientists sharing their feelings runs contrary to the dominant consumer capitalist culture of the West, which guards against – and attempts to divert attention from – the prospect of people getting in touch with feelings provoked by witnessing the wholesale destruction of the planet. We don’t know how long we have left on earth. Five years? 15 years? 30? Beyond the year 2100? But when we allow our hearts to be shattered – broken completely open – by these stark, cold realities, we allow our perspectives to be opened up to vistas we’ve never known. When we allow ourselves to fully experience the crisis in this way, we are then able to truly see it through new eyes. Like reaching new heights on a mountain, we can see things we’ve never seen before. Our thinking, attitudes, and outlook on life changes dramatically. It is a new consciousness, one in which we realize the pivotal stage in history we find ourselves in. Perhaps, within this new consciousness, we can live in this time with grace, dignity, and caring. Perhaps, here, we can find ways to save habitat for a few more species, while we share our precious lives and this precious time with loved ones, in the wild places we love so much, on this rare and precious world. LONDON—The warming oceans could start to return more carbon dioxide to the atmosphere as the planet warms, according to new research. And since 70% of the planet is covered by clear blue water, anything that reduces the oceans’ capacity to soak up and sequester carbon could only make climate change more certain and more swift. It is a process that engineers call “positive feedback”. 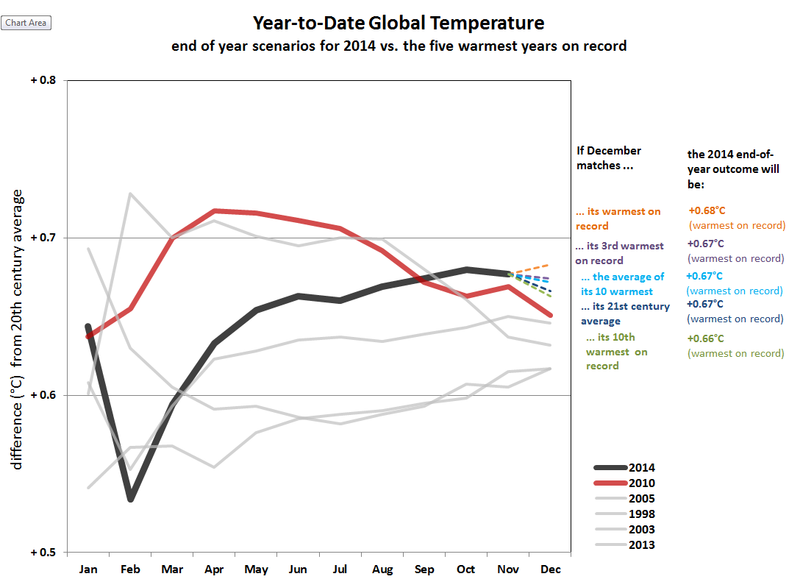 And under such a cycle of feedback, the world will continue to get even warmer, accelerating the process yet again. Many such studies are, in essence, computer simulations. But Chris Marsay—a marine biochemist at the UK’s National Oceanography Centre in Southampton—and colleagues based their results on experiments at sea. They report in the Proceedings of the National Academy of Sciences that they examined sediment traps in the North Atlantic to work out what happens to organic carbon—the tissue of the living things that exploit photosynthesis, directly or indirectly, to convert carbon dioxide—as it sinks to the depths. Sooner or later, much of this stuff gets released into the sea water as carbon dioxide. This is sometimes called the ocean’s biological carbon pump. In deep, cold waters, the process is slow. In warmer, shallower waters, it accelerates. And as there is evidence that the ocean is responding to atmospheric changes in temperature, both at the surface and at depth, the study suggests that “predicted future increases in ocean temperatures will result in reduced CO2 storage by the oceans”. The research was conducted on a small scale, in a limited stretch of ocean, so the conclusion is still provisional—and, like all good science, will be confirmed by replication. But it is yet another instance of the self-sustaining momentum of global warming. Such positive feedbacks are already at work in high latitudes. Ice reflects sunlight, and therefore the sun’s heat. So as the Arctic ice sheet steadily diminishes over the decades, more and more blue water is available to absorb heat—and accelerate warming. The same gradual warming has started to release another greenhouse gas trapped at the ocean’s edge. Natural “marsh gas”, or methane, is stored in huge masses, “frozen” as methane hydrate in cold continental shelves. Methane exists in much smaller quantities than carbon dioxide, and has a shorter life in the atmosphere, but is far more potent, volume for volume, as a greenhouse gas. Researchers at the Arctic University of Norway in Tromso reported last month in Geophysical Research Letters that once-frozen methane gas was leaking from thawing ocean floor off Siberia. Some of this thaw is natural, and perhaps inevitable. But some is connected with human influence and could accelerate. Arctic methane, like ocean organic carbon, has a biological origin. It is released by decaying vegetation under marshy conditions and tends to form as a kind of ice at low temperatures and high pressures, much of it along continental shelves that, at the height of the Ice Ages, were above sea level. The International Union for Conservation of Nature also reminded the world last month that the ocean plays a vital role in climate, and that plankton, fish and crustaceans could be considered as “mobile carbon units”. In this sense, the fish in the sea are not just suppers waiting to be caught, but are important parts of the planetary climate system. The healthier the oceans, and the richer they are in living things, the more effective they become at soaking up atmospheric carbon. “The world is at a crossroads in terms of climate health and climate change,” said Dan Laffoley, vice-chairman of the IUCN World Commission on Protected Areas, introducing a new report on the marine role in the carbon cycle. Robert James Parsons, a freelance journalist based in Geneva, writes regularly on international affairs (among other things) for the Geneva newspaper Le Courrier, and Le Courrier has turned 147 years old and is the last independent daily in Switzlerland, supported, like Truthout, by its readers. -Scientists predict that lethal heat waves in Europe, and ice storms and big freezes across the globe, could become regular events if greenhouse gas emissions are not controlled. Global average temperatures continue to rise, but new research shows that the extremes of heat and cold are rising even faster. Scientists report that heat waves have got hotter and cold snaps have got colder at a more extreme rate – and that continuing greenhouse gas emissions will mean that, in another two decades, Europe could experience once every two years the sort of lethal heat waves that occurred once in a thousand years. Scott Robeson, professor of geography at Indiana University Bloomington in the US, and colleagues report in Geophysical Research Letters that they analysed a set of temperature records from 1881 to 2011 and graded them according to how near or far they were from the normal averages of any particular region of the globe. They found that the temperature anomalies – extremes of heat and cold – increased more than the overall average temperature of the whole planet. They also found that cold anomalies – unexpected ice storms, blizzards and big freezes − increased more than the warm anomalies until about 30 years ago. Since then, the heat waves have started to outpace the cold snaps. The study offers a new way to consider the much-debated “pause” in global warming since 1998. It could be that warming continued over most of the planet, but was offset by strong cooling in the winter months in the northern hemisphere. Professor Robeson says: “There really hasn’t been a pause in global warming. There has been a pause in northern hemisphere winter warming. Robeson and his colleagues are not the first to identify the importance of extremes of temperature in the pattern of global averages. Nor is this the first time that UK Met Office scientists – this time led by Nikos Christidis – have forecast more, and more severe, heat waves, not just in Europe but in many regions. In 2004, Met Office researchers looked at statistics since 1990 and decided that the 2003 European heat wave − estimated to have claimed at least 20,000 lives, and possibly many more − had been made more than twice as likely because of human influence on the climate. In a paper in Nature Climate Change, they look at the pattern of warming between 2003 and 2012. In that period, summers on average warmed by 0.81°C. This warming means, they say, that heat waves − and extreme heat waves such as the lethal event in 2003 − have become 10 times more likely. “Extremely warm summers that would occur twice in a century in the early 2000s are now expected to happen twice a decade,” Dr Christidis says. Rep. Chris Gibson (R-New York) announced plans to introduce a pro-climate science bill in an effort to help others “recognize the reality” of the situation. His effort would also put lawmakers on the record during the process, so that their denial position would become part of the permanent public record. The White House issued climate change guidelines for hospitals, and declared that ACD is a public health hazard. The issuing of the hospital guidebook was an effort to assist health-care facilities in coping with the multiple threats posed by extreme weather.